CHICAGO REPORTER: The amount paid out for police misconduct in 2018 is more than the city has paid in any year since at least 2011. CHICAGO — In a year when the city’s lawyers were hashing out the details of a federal consent decree that will govern police reform efforts for years to come, Chicago taxpayers paid out more than $85 million to settle police misconduct lawsuits and an additional $28 million to outside lawyers to defend these cases. 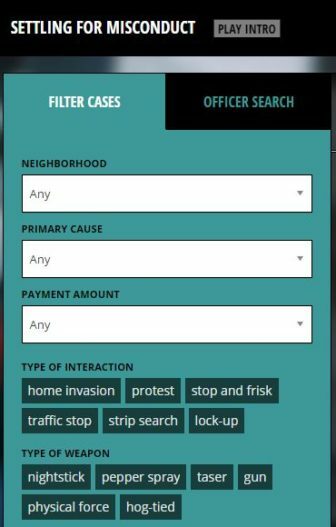 The amount paid out for police misconduct in 2018 is more than the city has paid in any year since at least 2011, according to data released by the city’s Law Department and analyzed by The Chicago Reporter, and more than what was paid in the previous two years combined. It brings the total tab for police misconduct in the past eight years to well over half a billion dollars. The high figure is driven in part by the payment of several high-profile cases last year. It includes $16 million paid to the family of Bettie Jones, who was shot and killed by Officer Robert Rialmo in Dec. 2015; $15 million paid to the families of two men who were killed by off-duty detective Joseph Frugoli in a 2009 drunken-driving incident; $9.5 million for the family of Jose Lopez, who was gravely injured when he was tased by Chicago Police officers in 2011; and $3.5 million to the mother of Niko Price, who was shot and killed by former officer Marco Proano in 2011. It also includes payments for several wrongful conviction lawsuits, including $9.3 million to James Kluppelberg, who was released after nearly 25 years in prison for an arson he says he confessed to after being tortured by Jon Burge’s “Midnight Crew”; $4 million to two men who were wrongfully convicted of a 1992 double murder; and $3.5 million in the case of Patrick Hampton, who was released after serving 20 years in prison for a sexual assault after his conviction was thrown out on claims that Chicago police detectives fabricated and withheld evidence. As these high-profile cases show, lawsuits can take years to work their way through the court system, so the large sum paid out last year is not necessarily indicative of an increase in police misconduct. In fact, the number of police misconduct cases paid out was down slightly from the previous years. However, as in past years, the city paid out nearly one lawsuit every two days, on average. And the majority of them paid out not millions but rather tens of thousands of dollars. The median payout was $50,000. The smallest payouts were for just $500. The $113 million does not include cases of property damage, minor car accidents, vehicle pursuits or employment-discrimination lawsuits. The cost is more than five times what the city budgeted for police lawsuits last year, meaning the city likely borrowed money to pay the costs of police settlements, as it has done in all but one year since 2008, according to city records. The sum also does not include the cost of outside lawyers hired to represent the city in the negotiations over the consent decree. In 2017 and 2018, the city paid more than $4.2 million to outside lawyers for the consent decree and related lawsuits. Last month, a federal judge formally entered the consent decree and appointed a monitor to oversee its implementation. The monitor is expected to cost $2.85 million per year. This story was originally published by The Chicago Reporter, a Chicago-based nonprofit news organization that aims to confront racial and economic inequality using the power of investigative journalism. Sign up for their newsletters here: chicagoreporter.com/signup.